These flowers have definitely seen better days (such as the wedding day). This demonstrates something that frustrates me about Chad and myself. We sometimes let things go a bit too long before taking care of them. I could have thrown these away today when I was gathering garbage to put out for pickup tomorrow, but I just didn't think of it. They are actually starting to look kind of cool because they are drying out and are a little brown around the edges. Oh well. On the other hand, we planted grass seed yesterday and I actually got up early this morning to water it and Chad watered it when we got home. We're hoping it grows well because we are so excited to be rid of the pachysandra. I'll probably post a picture once the grass sprouts. Oh my god! We went to ACME today and I was looking at the cheese and what did I see? MOLDY CHEESE IN THE FRONT OF THE SHELF! It was so disgusting. I almost walked out of the store without buying anything, but I didn't feel like going somewhere else instead. I wonder if this is what they mean by "Naturally Aged" on the package?? Haha. I was a little worried because it was almost the end of the month and I hadn't made anything from my Bon Appetit yet. I decided to make this dinner for Chad tonight because he was coming back from Orlando. It is Shrimp and Scallop Posole and it was delicious! You can find the recipe here. I was so excited to see our bleeding heart come up this year. My mom got it for us last year, so this was the first time it grew back (bleeding heart is a perennial for those who don't know, so you cut it all back in the fall and then it grows back in the spring). I was a little nervous this year because we had planted all these perennials and ferns last spring and I just wasn't totally sure that they would come back this year, but pretty much everything seems to be doing really well! The bleeding heart grew like crazy this week! The flowers are adorable and the leaves are kind of water-repellent, so when it rains, there are all these little beads of water on the leaves. Very cool plant. I went out to dinner tonight with Heather and Greg (from Golder), and two of Greg's friends (Eric and Sean) at one of my favorite restaurants, Le Creperie Beau Monde. We were going out to support "Dining Out for Life" which is a program where restaurants agree to contribute part of their proceeds from one night to help fight AIDS. I love this place, the crepes are so good. This was my entree - chicken, ratatouille, and goat cheese. Heather and I shared a special dessert crepe - sweet cream cheese, raspberries, chocolate, and raspberry sorbet. Very tasty! We had a great time. I hit 50,000 miles on my car today. It was kind of exciting, but it also means that I'm halfway to 100,000 miles, which I see as a milestone in the car's life (in a bad way). With all the driving I do, I see a lot of crazy driving on the road. Today was somewhat of a painful day because first of all, this morning, there was a brief note made during the traffice report that there was a fire somewhere along my route. They said there were detours around it and didn't mention a huge backup, so I decided to take my chances. It turned out that it wasn't in my way and didn't cause much trouble for me. There was all this black smoke coming up from it but I couldn't see the fire (I think they had extinguished it by then). I couldn't get a good shot of the smoke, but as I was passing the fire (right after getting on the bridge) I saw this person a few cars ahead of me turning into oncoming traffic. Apparently, they didn't feel like driving to New Jersey today. You can see this person here ... the one that looks like they are about to be plowed over by a truck. Now if you ask me, it probably isn't the best idea to try to turn right in front of a truck. Especially considering there is another lane of traffic on the other side of the truck that he wouldn't be able to see. Anyway, that was the first thing. 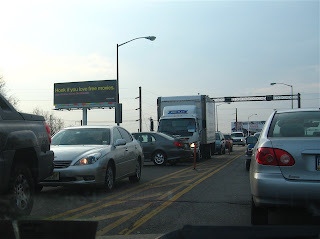 Then on my way from work to class, the Vine Street expressway had mega backups at my exit. It took me about 20 or 25 minutes to get to my exit. It would normally take about 3 or 4. People kept pulling out from behind me and driving up ahead and then getting back in way up ahead of me. I HATE IT WHEN PEOPLE DO THIS! I think it is one of the rudest and most inconsiderate things you can do when driving. Anyway, not a great driving day but oh well. 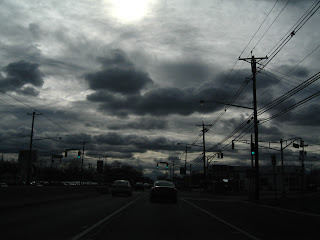 Here is a photo I took today on my way to Drexel after work. You can see some of the new development that is happening around Philly these days. Sadly, it is kind of beautiful in a way. Seina, Phthisis, and I had a brief discussion about this from the top of the Seattle Space Needle. We found it somewhat depressing that we were looking out on a multitude of city lights thinking about how beautiful it was, when the production of energy to power those lights has probably caused the destruction of many beautiful nature places in the world. This morning Chad and I made breakfast for our neighbor, Deb, and my parents. Chad made muesli (Deb's recipe) and scrambled eggs with goat cheese, and I made gluten-free scones. Deb is allergic to gluten so we attempted these gluten-free scones so she wouldn't be left out. They turned out pretty well, actually, but we decided to call them Gluten Free Breakfast Squares instead of scones. Deb brought fresh squeezed orange juice and a berry salad. My parents brought Asti Spumante so we could have mimosa beverages. We ate outside at Deb and Bud's lovely table. This is definitely one of the nicest things about warmer weather. Today got a little too warm for my taste (like 83 F or so) but it was lovely in the morning and in the evening. Chad and I went out there again at night to have dessert with Deb and Bud and their nephew. Good times. Oh yeah, and we got some very nice plants today at Primex. Can't wait to plant them!! We saw Chad's family today and his Aunt Beth brought us our Easter "Baskets" since we weren't able to join them for Easter this year. As you can see, they aren't really baskets, just bags. But Aunt Beth is so crafty. She got us different colored bags and then put our names on them using puffy lettering that looked really neat! The leaves on Deb and Bud's Japanese Maple trees are starting to come out! This is the little one in a pot on their porch. It is so cute! Don't the leaves look kind of funny? Don't mind the black plastic bag in the background. That is a bag of leaves that has been sitting next to the tree with about 6 or 7 other ones to keep it warm through the winter. Some of the plants in the garden seem to think that Spring is in fact coming. This is a fern that has sprouted a whole bunch of tiny fronds. It is so adorable. I really hope Spring is right around the corner and that it will stick around for a while! I can't believe I forgot to post my photo yesterday! Rest assured that this was in fact taken yesterday!! 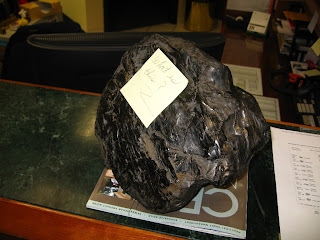 Anyway, Ruth had this rock on her desk yesterday with a sticky note saying "What is this?" No one knew what it was. I thought it looked kind of like obsidian but apparently it isn't. Ruth thinks it is a chunk of coal. What do you think? The sky was so beautiful this afternoon as I was driving to class from work. It was like there was a huge storm coming, but I guess not since it isn't raining right now! By the way, I posted some photos from the wedding on flickr. I received a somewhat frantic call from my father today asking if I would come to their house immediately and put my outfit from yesterday back on so we could take some pictures. My mom was worried that there weren't enough photos of the family, especially photos of her with Erin, so she wanted to take some more. I went over and we took a bunch of photos and then ate leftovers. 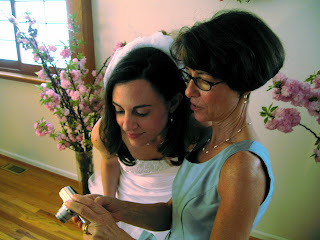 This is a picture of Erin and my mom reviewing the pictures to make sure they are okay. It was interesting. I was on a time crunch because I had to do homework for tonight (not to mention that I had a sore throat and just wanted to sleep all day) and Erin and Matt had to catch a plane to California!! Oh what fun. So today the big day finally came for my sister and Matt. The wedding was beautiful and pretty much everything went exactly as planned, so that was very fortunate. Oh yeah, did I mention that there were torrential downpours all day long and roads were closed all over the place? But almost everyone was able to get there on time so it wasn't a big deal. It was kind of peaceful actually. Here is a cute photo of Matt feeding Erin the wedding cake. The cake was very pretty. It had little cherry blossoms all over it. I'll post a couple other photos to my flickr site within the next couple days. Here is a photo of one of the scallops I had at our fabulous rehearsal dinner today. Tomorrow is the big day! We saw them tonight at the Painted Bride. This is the stage. It was awesome. Too tired to write more. There should be some fun posts after this weekend! Chad made us espresso in his Italian style espresso maker tonight. I was really tired today for some reason but needed to get some homework done tonight. This was a great pick-me-up. It was quite tasty (after I added a bit of sugar and cream!). This was my favorite photo of the process because you can see some of the steam. Very cool. Sometimes I think Chad and I are totally disgusting. Like tonight, we went to ACME to get some groceries and since we didn't feel like cooking, we bought "imitation krab chunks" (it is so fake they can't even call it imitation crab) and cocktail sauce and had that for dinner. It was so tasty, but ... is there something wrong with this??? I'm always finding interesting things at Chad's office. He likes to have lots of "things". These are a few things I found today that he got for free from various departments at Drexel. I'm jealous! I don't get interesting stuff like this from Golder. I got a fleece and some shirts for working, but they are kind of boring. Oh well. I had myself a nice chocolatey snack tonight. I was craving chocolate before I went to class and had to wait until I got home. This is Cadbury Royal Dark chocolate, snow caps, and mini M&Ms. Yum. I got home at about 11 AM today and found that Chad had cut the daffodils from out front and put them inside on the table. He had planned on making breakfast for me when I was supposed to get home closer to 8 AM or so (my flight was re-routed and I was stuck in the Seattle airport from 5:45 PM until 11:30 PM last night). Isn't he the sweetest? We ended up going to my parents' house for brunch which was nice but I was kind of out of it. We came home at 3:30 or 4:00 and I went to sleep until about 8:30. Now I have to see if I can get back to sleep so I can get up and go to work tomorrow. Yippee! Check out these Fancy Lobster tails! I took this photo at the Pike Place Market today. It was crazy there, but cool! It makes me wish I lived here because then I could actually buy fresh fish, meat, and vegetables there. Of course, when we lived in Philadelphia and could have gone to a market like this, we didn't go very often. Oh well. Seattle really is a lovely place. Okay, so this morning when I woke up I realized that the post I put up late last night was not actually a photo I took myself (just in case you all hadn't noticed that I was IN the photo) and so I thought I would put up one that I actually did take yesterday. This is a picture of the amazing bed in my hotel room. I stayed in a suite at the Moore Hotel and when I went in and saw this bed, I got very excited. This was not your typical hotel and was decorated so tastefully. I love it and hopefully Chad and I will stay here when we come back in July. I found the staff to be very friendly and helpful, actually I've found pretty much everyone in Seattle to be friendly and helpful. Anyway, if you like more of a European hotel, then certainly check this one out (it is also very reasonable priced and located just a few blocks from Pike Place Market). Tonight I had the pleasure of meeting two of the greatest people! Well, I'm not sure if you can really say that I "met" Seina for the first time tonight, considering the fact that we have "known" each other since 7th grade (so about 12 years or so). We were penpals for a class and just kept in touch since then. I am so glad we did because I had a wonderful time with them tonight. I think we were all a bit nervous because there was so much anticipation. We have always discussed meeting each other since we have been in touch for longer than I've known most of my best friends, but it just didn't work out until now. 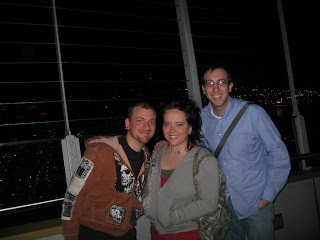 This photo was taken at 520 feet in the Seattle Space Needle. Phthisis is afraid of heights and had never been up before, but it wasn't actually that hard to convince him to go up and he did very well! No fainting or anything! I had a great night and now I'm all alone at the hotel ... At least the hotel is quite nice, especially my room. I've got photos of that, but I'll probably post them on flickr instead so be watching that over the next few days. Sorry this post didn't make it in before midnight but I was having too much fun to make sure to be back early to do my post! So I am at an internal Golder conference with other GIS and information management people. We had some great sessions today and started to get to know each other. We went out to dinner at a place called Salty's that has a great view of the Seattle skyline from across some water (not sure WHAT water it is). They had some interesting sculptures out in the front and this was one of them. At least, I think it was a sculpture and not just something left behind at some point. So I missed a day for the first time, but it was hardly my fault. First of all, when I got to Philly airport, I found that there was no more free wireless internet in the B-C concourse like there was a few months ago. Then, I wasn't able to connect to any of the wireless internet spots in the airport although Yong could. Then our flight was delayed by 2.5 hours so we didn't fly out of Philly until about 9 PM. I just got to my hotel about a half hour ago and decided to post this even though I need to be up again in less than 6 hours. 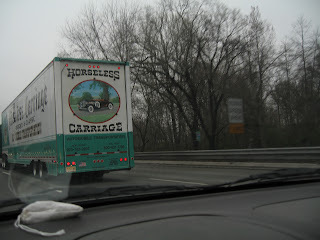 Anyway, on my way to the airport I saw this truck with what looks to be an old advertisement of some sort for an automobile back when it was a big deal that they were "horseless carriages". I thought it was pretty cool looking. So I'm going on a trip tomorrow to the Seattle area for an internal conference and I thought I would show some of the items that are most important to me when traveling. As you can probably tell, these are chargers for various electronic devices (pictured here are the chargers for my cell phone and my Nintendo DS). On a long trip I would need at least 4 of these. This time, I'll probably take only three, but it could be disastrous if I forgot one of them! Tonight was the first night of the spring quarter. I'm taking two more classes this quarter (I know, I'm a glutton for punishment). They were having the spring resource fair tonight in Main Building and it was a bit bizarre because there was a couch, two chairs and a rug set up in the middle of the court (as you can see in this photo) and so I thought it was kind of strange, like, were they offering free counseling or something?? This is a photo of some goat cheese that Deb and Bud brought over a couple weeks ago for an impromptu wine and cheese get-together. They got it at Whole Foods and it was outstanding. There is a layer of ash in the middle. I love goat cheese. We've had it in the fridge this whole time, so I had it for lunch today. Yum!